Stainless steel and heat resistant steel are characterized by high corrosion resistance, acid corrosion, oxidation resistance and heat resistance. Sanyo Special Steel produces high-quality stainless steel and heat resistant steel based on advanced production technologies and quality assurance systems. Stainless steel and heat resistant steel manufactured by Sanyo Special Steel are widely used in home appliances familiar to everyone as well as plants, electronic devices, ships, etc. 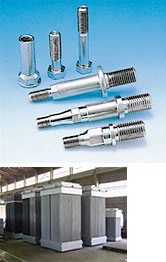 Characterized by high cold workability due to high corrosion resistance, ductility and toughness. A wide range of mechanical properties can be provided because the steel can be hardened by quenching. The formability and corrosion resistance are higher compared with martensitic steel. The steel also features high weldability. Features high resistance to pitting corrosion, intergranular corrosion and stress corrosion cracking, with higher strength than austenitic steel. Strength of the steel can be enhanced by precipitation hardening treatment. The steel is superior to martensitic stainless steel in toughness, corrosion resistance and weldability.